Ania is the daughter of Elzbieta Ficowska (saved by Irena, President of the Children of the Holocaust Organization in Poland, and active in Irena’s care). She and her husband Andrzej are favorites of the Life in a Jar students. Ania has visited Uniontown and the entire family plans a future trip. Their two sons, Carl and Phillip are also favorites of the students. 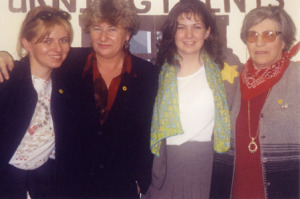 The family has hosted the Life in a Jar group several times in Poland.